The ancient Japanese art of origami is based on the idea that nearly any design--a crane, an insect, a samurai warrior--can be made by taking the same blank sheet of paper and folding it in different ways. The human body faces a similar problem/challenge. The genome inside every cell of the body is identical, but the body needs each cell to be different--an immune cell fights off infection; a cone cell helps the eye detect light; the heart’s myocytes must beat endlessly. In a remarkable article published in the December 18, 2014 issue of Cell, researchers at Baylor College of Medicine, Rice University, the Broad Institute of MIT and Harvard, and Harvard University describe the results of a five-year effort to map, in unprecedented detail, how the 2-meter-long human genome folds inside the nucleus of a cell. The title of the article is, “A 3D Map of the Human Genome at Kilobase Resolution Reveals Principles of Chromatin Looping.” The results show that the cell--like a microscopic origamist--modulates its function by folding the genome into an almost limitless variety of shapes. A centerpiece of the new study is the first reliable catalog of loops spanning the entire human genome. For decades, scientists have examined the regions in the close vicinity of a gene to understand how the gene is regulated. But as the genome folds, sequences initially far from a gene loop back and come in contact with those nearby elements. Looping has been a blind spot for modern biology. “For over a century, scientists have known that DNA forms loops inside of cells, and that knowing where the loops are is incredibly important,” said co-first author Dr. Suhas Rao, a researcher at the Center for Genome Architecture at Baylor. For more than a century, scientists have understood the basics of inheritance: if good genes help parents survive and reproduce, the parents pass those genes along to their offspring. And yet, recent research has shown that reality is much more complex: genes can be switched off, or silenced, in response to the environment or other factors, and sometimes these changes can be passed from one generation to the next. The phenomenon has been called epigenetic inheritance, but it is not well understood. Now, University of Maryland geneticist Dr. Antony Jose and two of his graduate students are the first to figure out a specific mechanism by which a parent can pass silenced genes to its offspring. Importantly, the team found that this silencing could persist for multiple generations—more than 25, in the case of this study. The research, which was published online on February 2, 2015 in PNAS, could transform our understanding of animal evolution. Further, it might one day help in the design of treatments for a broad range of genetic diseases. The title of the PNAS article is, "“Double-Stranded RNA Made in C. elegans Neurons Can Enter the Germline and Cause Transgenerational Gene Silencing.” “For a long time, biologists have wanted to know how information from the environment sometimes gets transmitted to the next generation,” said Dr. Jose, an Assistant Professor in the University of Maryland Department of Cell Biology and Molecular Genetics. “This is the first mechanistic demonstration of how this could happen. It’s a level of organization that we didn’t know existed in animals before.” Dr. Jose and graduate students Sindhuja Devanapally and Snusha Ravikumar worked with the roundworm Caenorhabditis elegans, a species commonly used in lab experiments. For at least 40 years, scientists who study how the body metabolizes sugar have accepted one point: there are four enzymes that kick-start the body’s process of getting energy from food. The discovery of these four catalysts for energy production, called hexokinases, generated more research into how the body metabolizes carbohydrates, and how interfering with those enzymes through medications could help manage metabolic disorders such as diabetes. But this biochemical foursome may not deserve all of the credit. According to research by scientists at Duke University and Northwestern, the hexokinase team actually has a fifth player. The findings were published online on February 4, 2015 in Nature Communications. “This swims against the past 40 years of research and what we thought we knew,” said Tim Reddy, Ph.D., a senior author of the study and Assistant Professor of Biostatistics and Bioinformatics at Duke. “Hexokinases are critical to basically all of our energy production. Finding a fifth one opens the door to more study into how we metabolize sugar, as well as genetic links to metabolic disorders.” The new protein is called HKDC1, and the researchers report that this enzyme may be a genetic predictor for whether an expectant mother develops hyperglycemia, or excess blood sugar, during pregnancy. Hyperglycemia is a potentially harmful environment for a growing fetus and can contribute to obesity and diabetes later in the child’s life. While at least 4 percent of pregnant women develop diabetes during pregnancy, as many as 400,000 women each year in the U.S. have gestational hyperglycemia, which equals about 10 percent of expectant mothers. In the largest longitudinal study of the microbiome to date, researchers from the Broad Institute of MIT and Harvard, Massachusetts General Hospital (MGH), and the DIABIMMUNE Study Group have identified a connection between changes in gut microbiota and the onset of type 1 diabetes (T1D). The study, which followed infants who were genetically predisposed to type 1 diabetes, found that onset, for those who developed the disease, was preceded by a drop in microbial diversity, including a disproportional decrease in the number of species known to promote health in the gut. These findings, which were published online on Februar 5, 2015 in Cell, Host & Microbe, could help pave the way for microbial-based diagnostic and therapeutic options for those with T1D. 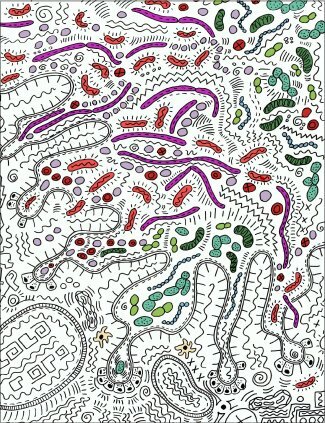 The human microbiome, which consists of the trillions of microorganisms (bacteria, viruses, and other assorted “bugs”) that reside in our bodies, has become an area of growing interest to the medical community as researchers have begun to probe the role it plays in human health and disease. While most bugs in our microbiome are harmless, and even beneficial, changes in the microbiome (and in the interactions microbial species share with their human hosts) have been linked to various disease states, including diabetes and Inflammatory Bowel Disease (IBD). To explore the possible connection between changes in the microbiome and type 1 diabetes, a team led by Dr. Ramnik Xavier, M.D., an Institute Member of the Broad Institute and Chief of Gastroenterology at MGH, followed 33 infants (out of a much larger cohort of Finnish and Estonian children) who were genetically predisposed to T1D. From birth to age 3, the team regularly analyzed the subjects’ stool samples, collecting data on the composition of their gut microbiome. A new study led by Howard Steiger, Ph.D., head of the Douglas Mental Health University Institute Eating Disorders Program (EDP), in Montreal, Canada, in collaboration with Dr. Linda Booij, a researcher with Sainte-Justine Hospital and an Assistant Professor at Queen's University where?, is the first to observe effects suggesting that the longer one suffers from active anorexia nervosa (AN), the more likely he or she is to show disorder-relevant alterations in DNA methylation. When methylation is altered, gene expression is also altered, and when gene expression is altered, the expression of traits that are controlled by those genes is also changed. In other words, altered methylation can produce changes in emotional reactions, physiological functions, and behaviors. A report to be published in the International Journal of Eating Disorders, entitled "DNA Methylation in Individuals with Anorexia Nervosa and in Matched Normal-Eater Controls: A Genome-Wide Study," is showing chronicity of illness in women with AN to be associated with more pronounced alteration of methylation levels in genes implicated in anxiety, social behavior, various brain and nervous system functions, immunity, and the functioning of peripheral organs. "These findings help clarify the point that eating disorders are not about superficial body image concerns or the result of bad parenting. They represent real biological effects of environmental impacts in affected people, which then get locked in by too much dieting," says Dr. Steiger, Chief of the Eating Disorders Program at the Douglas Institute and a Professor of Psychiatry at McGill University in Montreal. "We already know that eating disorders, once established, have a tendency to become more and more entrenched over time.